Pay Scale: 25,000/- pm (Fixed) for two years. 6. Applications are invited for the post of Project Assistant (on contract) in research project entitled “Hindi to English Machine Translation System for Judicial Domain”. 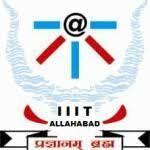 The duly completed application on prescribed format along with copies of supporting documents must reach to Prof. U S Tiwary, Department of Information Technology, Administrative Block, Indian Institute of Information Technology - Allahabad, Devghat, Jhalwa, Allahabad, Uttar Pradesh 211015 on or before 10/05/2018. The envelope should be super scribed as Application for the post of Project Assistant (on contract) in the Research Project HEMAT. A soft copy of the application should also be sent to ust@iiita.ac.in.